Since 2010, the best scoring names in our weekly mid cap report have outpaced the S&P 400 by a median 342 bps in the following year. 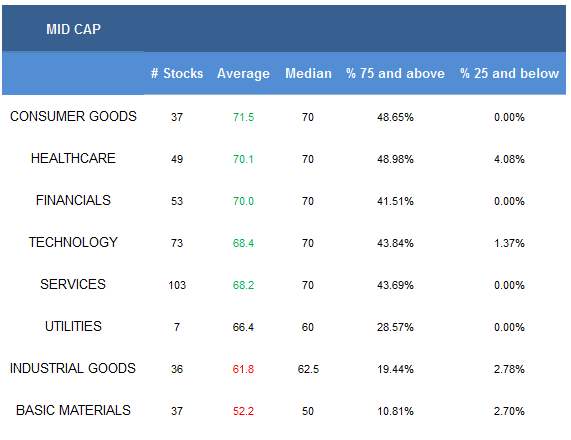 The top mid cap sector is consumer goods. The best mid cap industry is restaurants. The average mid cap score is 66.88, which is above the four week moving average score of 64.33. The average mid cap stock in our mid cap universe is trading -14.79% below its 52 week high, 3.79% above its 200 dma, has 7.07 days to cover held short, and is expected to post EPS growth of 14.42% next year. 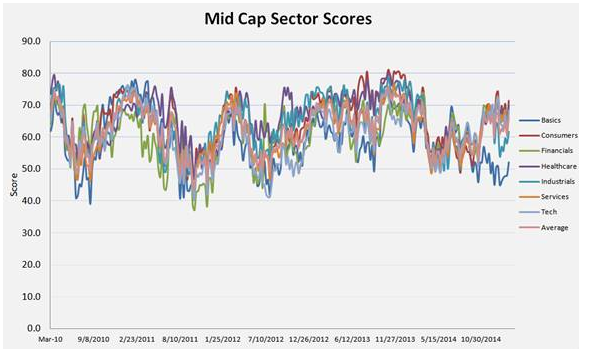 The highest scoring mid cap sector is consumer goods. Healthcare, financials, technology, and services also score above average. Utilities score in line. 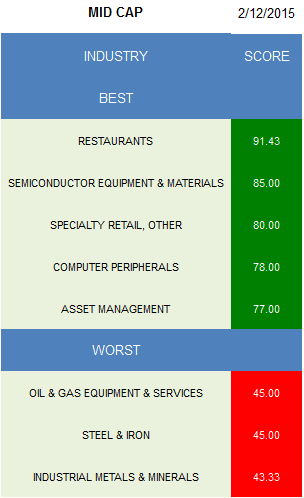 Industrial goods and basic materials score below average. In Q4, retail sales at food services & drinking places climbed 7.4% versus 2013. The Nat'l Restaurant Association estimates that restaurant employment will grow 3.4% in 2015 as retail foot traffic and average tickets climb (WEN, CAKE, BWLD, CBRL, EAT, PZZA). Semi equipment & materials (SPIL, TER, ENTG) offer upside given that the SEMI book-to-bill historically accelerates from here into summer. Specialty retail (AAN, BID, OUTR), computer peripherals (ZBRA, NICE), and asset managers (EV, OZM) also score strongly. In basic materials, only synthetics (AXLL, CMP) score above average. In consumer goods, buy processed & packaged goods (HAIN, FLO), auto parts (DAN, GNTX, TEN), and textiles (COLM, WWW, SKX). The best financials industries are asset managers, REITs (CBL, WRI, RWT, REG, DDR, BDN) and regional banks (FHN, SIVB, NPBC, WTFC). In healthcare, concentrate on medical instruments (NUVA, HAE, DXCM, WST, TFX) and biotech (CRL, GEVA, ACAD, ITMN, CLVS). In industrial goods, residential construction (NVR, RYL) is the only industry that scores above average. Restaurants, specialty retailers, and business services (DLX, MMS, GPN, CMPR, HCSG) are best in services. Semi equipment, computer peripherals, and technical & system software (TYL, CDNS) are the highest scoring technology baskets. In utilities, gas utilities (NJR) score best. Investing in a mid-cap is something of a mixed bag. Many investors look at mid-caps as a long-term investment in a company’s future. Essentially, when you invest in a mid-cap, you hope to help that company become larger over time. 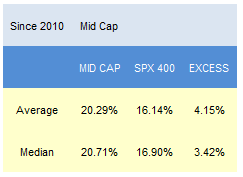 There are also some disadvantages to investing in mid-caps. For example, a mid-cap company is bound to fall harder in a failing market. If you’re looking to make a large profit quickly, you should probably avoid investing in mid-caps. However, you shouldn't ignore mid-caps in a niche market with high potential or mid-caps with a solid history of great performance. If chosen carefully, mid-caps make up a solid portion of a diversified and strong investment portfolio. So what I got from this is that one year performance of these types of funds is not as relevant to the investor as the long term performance figures. Just something to consider. Happy investing!